Rick Gall and his family are experiencing the blessings of living in a "Podunk" town, as urban folk like to call small communities across rural America. For the most part, Biggsville is a village of 340 and like most small towns, everyone knows most everyone else. They may even know more about you then you care they knew at times. But the flip side to all of this is, they work together. They plan community events, organize ball teams, coach Little League, attend school and church functions, work on 4-H and scouting projects, serve on clubs, town, school, and county boards, volunteer on the ambulance and fire departments, and they even celebrate with you when your babies are born, your children (or parents) marry or when you have your 40th anniversary, like Rick and Trudi Gall will, God willing, this November. But the best thing of all is, when tragedy strikes, and you feel you can't go on, the community of family and friends are right at your back doorstep, offering a helping hand without even being asked. It's the huge blessing of a small town that so many urban folk miss out on. Trudi Gall is one of Biggsville's own, and the minute the word was out that she had been life-flighted to University Hospitals in Iowa City, Iowa suffering from an aneurysm, you could see shock and concern on everyone's faces. Without skipping a beat, Chris Webb got the ball rolling and Kara Bigger, Heather Lant, and Stephanie Higgins were working organizing everyone around the county. A Golf Tournament drawing 26 teams of 4, along with an Auction, Hog Roast and a variety of activities was organized to help with the tremendous expense they knew the Gall family will be facing. The Benefit, held this past Sunday (Aug. 29), overfilled the Hend-Co-Hills parking lot and vehicles were being parked at the camp ground and occupants were shuttled up to the Clubhouse where they could take part in the fun of giving. Since Saturday, August 7th, Trudi's husband Rick, has not left his wife's side, except for one or two short instances. Doctors had given Trudi a slim 5-10% chance of surviving the break in the important artery that supplies blood to the brain. The rupture released blood into the skull and causes a stroke which is what happens when the blood flow to the brain is disrupted. Areas of the brain can be damaged within minutes. Depending on the severity of the hemorrhage, it can cause brain damage or death. Immediate medical attention is needed to help limit potential damage. On that Saturday evening, Trudi decided to accompany Rick to watch Chris Webb race his #54 IMCA Stock Car at 34 Raceway west of Burlington, Iowa. 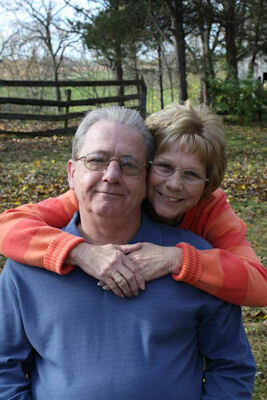 On their way home, she and Rick stopped by Riverbend Casino where she experienced a severe headache, stiff neck, and then a rush and swishing in her ears. She told Rick to take her to the emergency room before she went unconscious. 911 was called and she was transported to Great River Medical Center, just minutes away and life-flighted to Iowa University Hospital in Iowa City. Trudi is more aware of the symptoms than most, as she was a Medical Receptionist at EagleView Health Clinic in Oquawka. Yet, early that Sunday morning of August 8th, in Iowa City Intensive Care, Rick heard the worst news and family and friends gathered in their support. While life dealt the couple a hard blow, their life in Biggsville has produced the comfort of an amazing number of family and friends giving them an overwhelming amount of support. As Trudi would put it, "That's What Friends Are For" a favorite saying of her's and what the community decided to use as the theme of their benefit. And the blessings from friends continue to come in numerous ways with a second softball tournament planned in Oquawka on September 18, by Toni Webber. Meanwhile, Trudi is known as Iowa City's star patient by the nurses and she continues to stabilize in University Hospital Intensive Care, while doctors say it is nothing short of a "Miracle," that she survives. They first took her into surgery to pinpoint the bleed with a CTA scan (angiogram). According to her daughter Rudi Cole, they were able to clamp off the vessel with 9 coils and stop the bleed and then put in 1 drain tube to drain the spinal fluid. A re-bleed occurred within the hour and they rushed her back into surgery and put a second drain in. They put her on a ventilator and waited for 21 days for Vasospasm. After two weeks they put in a trachea and then in a couple days took her off the ventilator in order not to damage vocal cords. "This is tragic for the family," Rudi said, "Our family is so close-knit. She's our everything!" "We've been flooded with help and support," said Rudi, "and it's heart-warming! We appreciate what everyone is doing so much." Trudi followed her grandparents to Biggsville from Washington, Iowa and Rick came to Illinois out of the service. Rick works at Federal Mogul (formerly Champion). Both were on vacation and Rick, who had a second week of vacation, yet, was then able to take off 12 weeks due to the Family Medical Leave Act, though it comes without pay. Chad Gall, wife Karen, daughter Becca; L.D. Gall, wife Lindsay, daughter Alyson; Rudi Cole, husband Aaron, children Kylie, Gavin, and Annie; Heather and Jeff Lant, their children Kaitlyn and Todd; Hollie and Terry Shrader and son Hunter; Karli Hedden and son Logan. Before this happened, Mom was the picture of health, said Rudi. Now, it's basically a waiting game. She has hit a milestone and has been deemed medically stable but she has to pass a swallow test before the feeding tube can come out and a second drain was to be taken out Monday. The physical therapy will evaluate and see if she can go to rehab." Both Trudi and Rick had just enjoyed one of the best weeks of their life visiting L.D. and Lindsay Gall in the Quad Cities and Rudi and Aaron Cole in Minnesota and the grandchildren, and they had visited her sister in Tennessee. Rudi said when this happened friends organized this Benefit in just 21 days. "She's loved by everyone." "They ask me, "Why do you want to live in a podunk town?' It's because of things like this. I'd do anything to move back from Minnesota to Biggsville. "How do we thank this many people-It's been heartwarming. She had a 5-10% chance and now this week things are looking up. A week ago the surgeon told us it was nothing short of a miracle. I know it is due to so many prayers.-God's definitely in control. She's smiling, responding. She can't talk but she can move all four limbs and she nods yes or no. Friday she was able to mouth back "I love you." My dad's been there the whole time. The family truly appreciates all the support and ask for everyone to keep Trudi in their prayers.